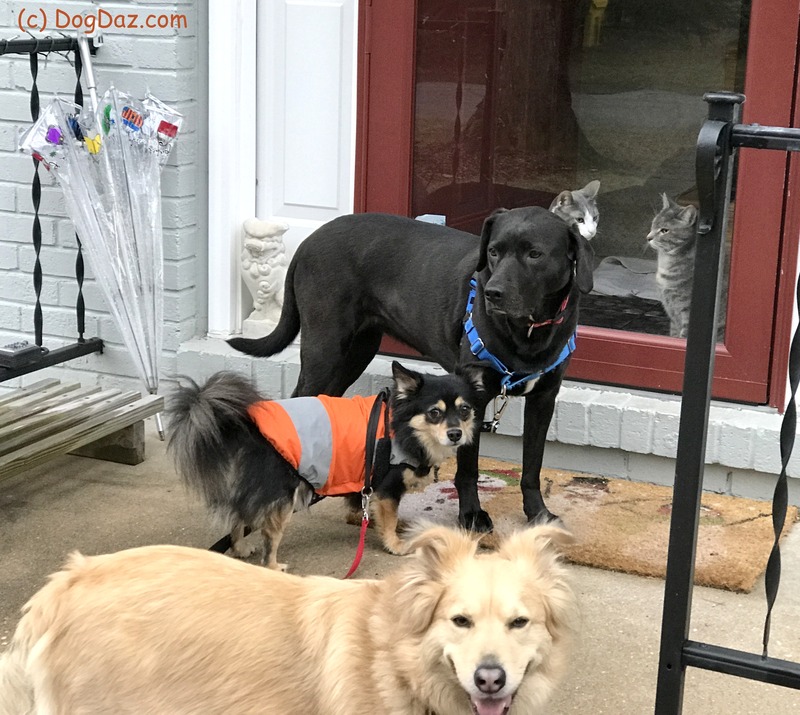 When the rain stopped the other day, I finally was able to take the canine trio for a dry walk. I left the front door open in case the cats wanted to catch some of the fleeting sun rays. As we came walking back down the street, I saw Nine and Mini Cooper watching our return. Were they happy to see their dogs returning? Maybe they were happy because they know that in the afternoon after I walk the dogs, everyone eats? But maybe they weren’t happy at all. Maybe they were saying to each other, “Drat! Here come those slobbering idiots again!” Personally, I like to believe the former – they miss their friends when they are gone. I am glad that my 4 cats are indoors only. I am not sure that I could keep up with 28 wet paws coming in the front door on a rainy day, 12 are quite enough. Happy Wednesday. Mini broke the screen the other day (or maybe a dog helped her) and was walking around on the deck. She went back to the door and wanted in (thank goodness). The outside is a scary place. And that string thing sounds terrible. Mom says that 4 dirty, wet paws are enough! I am with her, but what’s a Mom to do? At least I can pick Charles up and wipe him off with one small towel. The others are not so easy. Great shot! What sweet faces to be greeted by, whatever their motivation. Getting the gang all together huh? Where are you going? Coming home from our afternoon walk. Muddy paws=happy hearts for us here in the Desert Southwest!!! Thought you’ve been having rain this winter.